Doryman posted a comment to my Brigantine post wondering where was I in the photos. 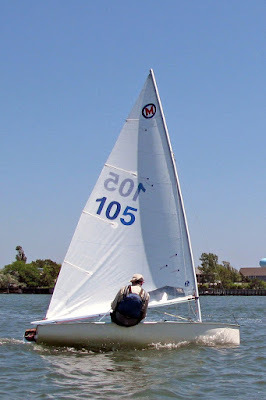 Humble of demeanor, I left out photos of me racing at Brigantine, but, since you asked, I was the one sailing a Laser. 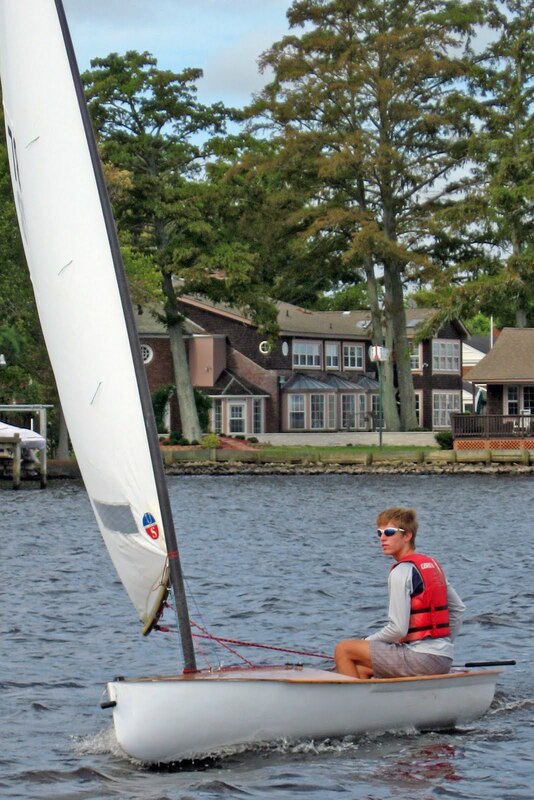 Um.....Actually there was three of us sailing Lasers in the Classic Moth regatta at Brigantine. Laser's in a Classic Moth regatta? How can that be? Well here is a photo of me and my "Laser". At one time she most certainly was a Laser, but now #105 is transformed, a rare Classic Moth emerging from the Laser chrysalis into a sailing craft we call a Maser. For the tale that can be told is about several intrepid Classic Mothist's, in true tinkering, Frankenboat tradition, have been happily sawing up old Laser hulls and then piecing them back together into Classic Moths (Masers). The trick is in figuring how to take a 13'4" (4.064 meters) Laser hull and squeeze it down to the Classic Moth length of 11' (3.35 meters). The genre was started by two Norfolk, Virginia Mothists, Randy Starks and Al Whitener. Initially they just lopped 2 feet fron the Laser transom; a sailable solution but unfortunately ending up with too much wetted surface to stay with other Classic Moths. Undaunted, these two embarked on building several more Masers. each version getting better. Here are the barebones steps to make a Classic Moth from a Laser (tip of the hat to both Randy and Al for their innovations). Look for an old abandoned Laser hull, either in the weeds or upside down baking in the sun, a Laser that hasn't been moved in years, preferably a Laser where the owner has lost everything but the hull. Buy hull. Cut raked bow off hull. Cut a chevron shaped wedge out of center of hull (eliminating daggerboard trunk) to shorten hull. Glass aft hull and front hull back together. To add more rocker to hull, slit keel line to about 3 feet from transom and push more rocker in. Glass keel line together. Pinch up bow and glass together. Make sure hull is no longer than 11'. Add 1/8 inch plywood bulkheads and decks (saving about 40 to 45 lbs on the Laser weight. Here are two Masers sitting on the lawn at the Elizabeth City Nationals. In the foreground is one of the Starks/Whitener versions. In the background is one built by Joe Bousquet. Classic Moth #105 is the last Maser built by Randy Starks. Look hard and you can definitely tell it retains the original Laser transom. Maser must retain the original Laser transom with serial number. Extra points if the hull still has the original Laser bailer well (and bailer). Must exhibit some lumpy unfairness along the topsides where the split hulls were joined. Bottom line, a top of the line, show quality Maser must have some Laser lineage visually preserved. (I would also add a so-so paint job to what I consider a proper Maser..... to highlight the tinkering history of this particular model; but that is just my preference). 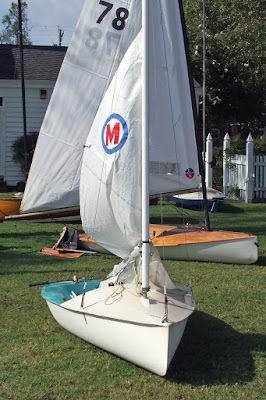 A shot of Joe Bousquet's Maser under sail. And a YouTube video of your humble scribe narrating another modification project on his Maser. Excellent. Better looking boat than the Laser. The Moth reminds me of the "DK" I sailed as a kid. It was 12 feet long, fiberglass hull and mast. no deck - just wood seats. Similar profile to the Moth. I don't get it. 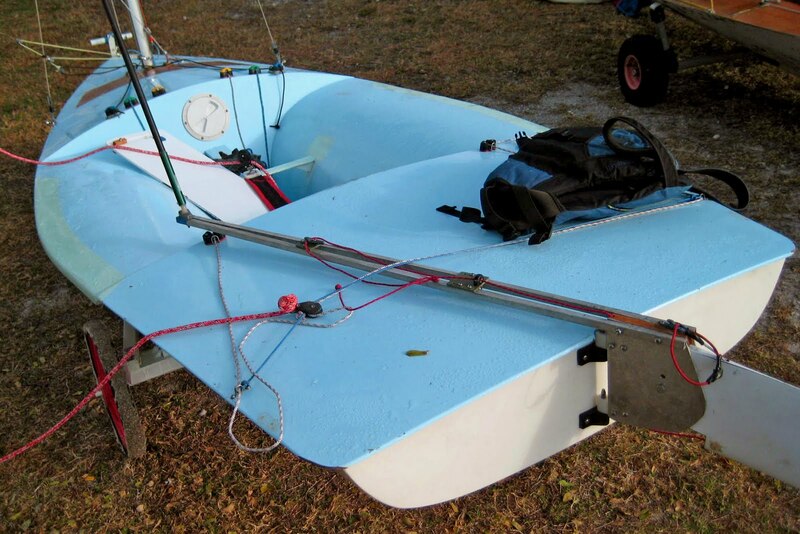 Why would you want to make an already tiny boat smaller? I could see glassing two Lasers together to make a proper-sized boat, but this is ridiculous. And where do you sleep on that silly thing? Excellent, there is a God!!!! Music for Fridays; House of Fools "Interested"
Music for Fridays; Maynard Ferguson "Birdland"
Music for Fridays; Beck"Where It's At"